A little over a year ago, we introduced you to a fantastic product called Insta Fire (See our video at the bottom of this post when the creators came and cooked us lunch using only InstaFire!) We’ve just gotten word that with their increased growth, and increase in production costs, their pricing will be changing next month. They currently have a 5 gallon product that we sell for the lowest price online WITH FREE SHIPPING at $59.95. After the price increase, they will only be offering a 4 gallon bucket (which is 1 gallon less) and will cost the SAME as the current 5 gallon (That’s basically like a 20% price increase!). So if you’ve been wanting to get some fuel stored, we wanted to let you know about this, and recommend you purchase before the month is over. We will only be able to sell the 5 gallon up until the end of the month or while supplies last, so don’t delay! 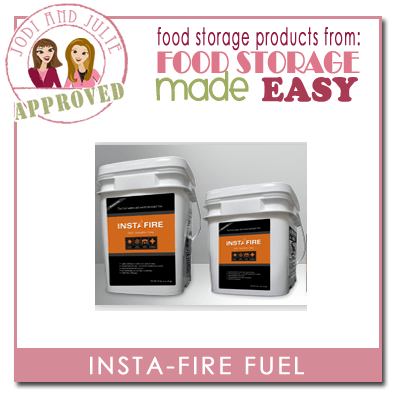 Insta Fire is a safe, simple, and versatile new fire starting product. It has water-repellant properties, a fifteen minute burn time and a thirty year shelf life. Use it to light campfires, prepare charcoal briquettes, or as a safe and reliable fuel source for cooking or heating in emergency situations. In an emergency you will most likely need to boil water, cook your food and heat your shelter. This fuel can be used in a wide variety of cooking stoves, even ones you can make out of #10 cans! Proper ventilation is always necessary. Useful for lighting and drying wet wood, building a campfire or bon fire, quickly lighting charcoal, etc.